How to Install Android Emulator on Laptop, Windows PC, Computer | Free Pc to Phone Calls, Free Voip Calls to India International ! Though the task of installing android emulator on your personal computer is quite simple and just few steps, however a step by step tutorial (with images) is always very helpful. In this post, we will teach you how you can run android emulator on your laptop or your Desktop (PC). You will find many such tutorials on the internet, however most of them provide either too much information and very little information. Some of them which are helpfup are outdated (quite old as things have changed now). So hope this will be helpful to you guys. Please note that this tutorial is based on assumption that your computer OS is windows. In short, learn how to run android apps on windows based computer. - If you don't have android device, you can still enjoy the apps by android emulator on PC. - Your phone may be still running Froyo or may be Donut, but you can enjoy the latest Android Operating System (Android 4.1) on the emulator. Get a feel of it before actually using it on your mobile. 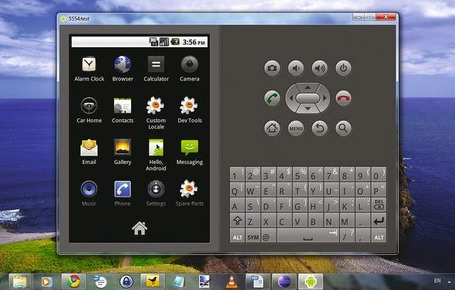 - Be creative, make your own Android Apps and try them on emulator. - Run apps like Viber on your computer, which do not have any app for pc. This way make free calls from pc to mobile. We already have posted about this in a separate tutorial. - Create a google account. Skip this step if you already have one. This is will be required when downloading Google Android and accessing Google Play store. - Download Java on your computer if not previously installed. Follow this link. - You need to get Android SDK. The Android SDK provides you the API libraries and developer tools necessary to build, test, and debug apps for Android. - Download Android SDK from this link. What is Android SDK ? - A software development kit that enables developers to create applications for the Android platform. The Android SDK includes sample projects with source code, development tools, an emulator, and required libraries to build Android applications. - Install the SDK Tools. - The installer then saves the Android SDK Tools into a default location (or you can specify the location). Make a note of the name and location of the SDK directory on your system — you will need to refer to the SDK directory later, when setting up the ADT plugin and when using the SDK tools from the command line. 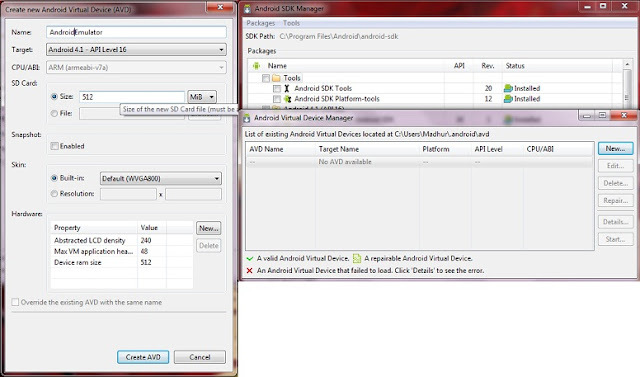 Once the tools are installed, the installer offers to start the Android SDK Manager. - It will show the list of OS (which Android OS to be downloaded (along with Source Code)). Its like you need to decide which Android (Froyo, Donut, ICE etc).. you want to run on your laptop. - Choose the latest "Android 4.1 (API 16)" and click on install package. On the new window that pops up, select accept all and install. It will take some time. At this step, you need to decide whether to go for Eclipse Plugin or not. It will be required if you want to develop apps for android. We will be writing a separate tutorial on this Eclipse Plguin and ADT. - After Android OS emulator has been installed. Click on "Tools" Option, and select "Manage AVDs". - A new window will pop up. On the right hand side (as explained in image), click "New". AVD is simply Android Virtual Drive (or android emulator drive on computer). - In the target option, select the OS package which you have just download. In this case "Android 4.1", select installer package size as "512". Click "Create AVD". Accept everything (ok) in the pop up window. An Android Virtual Device (AVD) is an emulator configuration that lets you model an actual device by defining hardware and software options to be emulated by the Android Emulator. You can create as many AVDs as you need, based on the types of device you want to model. - Select AVD Manager and select the AVD which we just created. "Click Start". - Click Launch in the pop up window. - Android OS will start on your PC. It is much like the android mobile on your computer with screen and keyboard. Your Android Emulator is ready on your laptop. It is much like any other Android Device (mobile) and you can simply install the apps just like your phone. You will see Google Play store from which you can download as many apps as you like. Facing any difficulty, not able to run the emulator. Just let us know and we will help you out. I have followed your instructions on installing the Android Emulator but when I tried to create it, I got a message error that it needed Androia API 18 image to create. Can you help?